Are you still ignoring to use the power of a personal branding that configures your happy sales? Or, are you a new small business blogger? Perhaps it is a high time to scale out or plan your business recognition. And figure out or start a journey to the expected reputation directing your mission following a vision towards a sales goal. What is a Personal Branding? In a nutshell, a brand means a trust on you – a reputed image of you. A personal branding is an action of building a reputation – a continuous process of creating a reputed self-image. The image that would achieve a state of the art recognition, reputation and influence over own productivity or products. 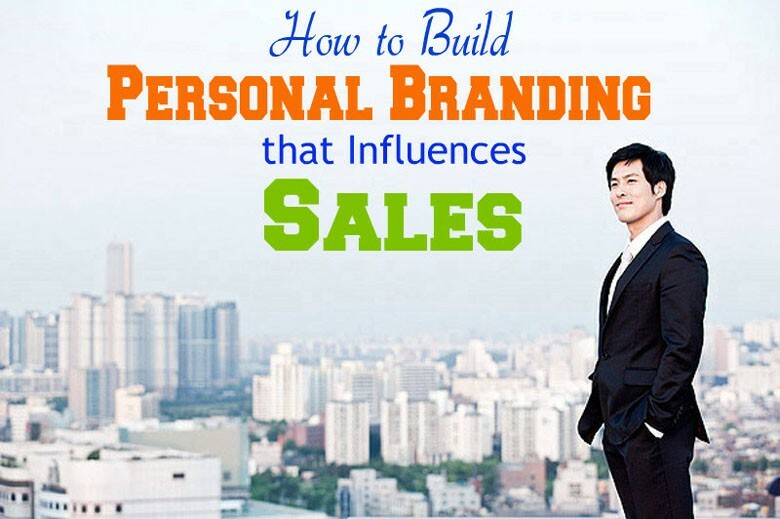 What are the Sales that would be influenced by a personal branding? Sales are a plural of sale that refers to delivering something – which is an extreme point of conversion in a business. It practices an exchange of money and goods in each transaction. To achieve an expected volume of sales, you’ll have to drive a long journey by content marketing vehicle as well as social media actions. Then personal branding makes a professional be a maven in his own field of expertise. It leverages the sales when everything runs in right order following the rules of an artful branding game to empower the person to be an influencer. The personal branding strategy refers your stand to be striving to build a significant influence on your marketing and sales factors. How it possible? To build a powerful personal brand means branding your personal expertise that helps to the targeted audience group around the globe or locality. To sustaining your sales, you’ll obviously have to link your purposive branding influence over the marketing of particular expertise or product. Let’s now dive into the components much deeper following the associated factors below. While you’re going to start your personal blog for selling your expertise, you need to emphasize on your personal brand. Then, you’ll have to realize your true individuality to start branding from the point that you truly occupy. Map the clear real you by self-assessment. Affirm your real persona. Let it be imagined as a zero ground you’re going to start your personal brand. Your authentic self is the true spectrum of the future brand. Realize who you are, in fact, erasing all your fakes or pretending. What is your own trust in your own journey? Remember that people connect with the person who is Mr. Right – relevant, reliable, regardful, and resourceful. Your real self will be your real focus on the people. Standing on your true ground, you’ll have to focus you the world using your personal blog. While you’re focusing real you to the world, create a habit of self-management. You’ll have to rethink in every attempt of delivering content why you should or shouldn’t do a particular action. It will create auto-command for you to deliver the decision which is prior to doing first and fast. A strong self-management over yourself could keep you up in consistency fixing any tiny wrong. You’ll have to know the social awareness regarding the expertise you own for dealing. Importantly, get your recognition of the way of social media that you deal with your expertise. And understand the social customs, changes in social networks, activities, emotions, taste, and behaviors. It will leverage you to figure out the real content that you need to be delivered intelligently. What will be your personal style of presentation over your own expertise? How you’ll build your art of emotion connecting with social others emotion? The approaches how to be made social media marketing with adequate management? How to be approached personalized content (like email, newsletter, mobile text etc.)? The significant remedy over the above issues could help your personal branding to be reached on a new horizon. The journey of personal branding deserves continuous effort to innovate a better workable method for right management. Build your powerful content marketing strategy on all major social media using the unique power of each individual social site for a better outcome. Take over your ability to run an emotional marketing of your expertise. Your content marketing should be accompanied with the vectors such as attractive product name, slogan, logo, color, emotional words, images, infographics, epic story and all others variables that support the personal branding comprising your product as well. Hold a strong brand image in mind always. Get your connectivity policy that relationship marketing is first, then sales. In this regard, pick out the persona that relevant to your own expertise and product. Use the powerful social tools like FB messenger, Ln messaging, Twitter messaging, FB event marketing and so on. Generate content for your personal blog that follows your strong expertise. You and your product simultaneously used to get alignment in branding through the valued content. You never should drive your content vehicle on the crossroad that disrupts your branding path. It is the better way to follow own niche or product line to produce the highest value in your content. While you write an article, you needn’t write it as like as others do. You’ll have to pitch so far deep thought of the topic that provides higher value than others. Content – make it different, authentic and profound that inspires the audience to get a lead of your value. While content helps prospects to regenerate the same product what you already experienced, then they will follow you. Thus content builds authority over the valued content. Authority invites personal branding. Content value creates influence. Influence is a power of creating sales. Whereas sale is your core target to build a regular income stream, each monetization needs to be embedded with your firm influence you could generate continuously. A sustainable stream of influence means your personal branding as well. You needn’t reach out your content value out of your target audience. Define your targeted traffic that who will be your core prospect. You obviously require conducting SEO using long tail key terms in the content. Long tail keywords could help you to reach your content to the targeted search visitors. SEO will help to solve your issue how to build personal branding with SEO. Besides, you might use the classified groups and communities in the social media. Facebook business page, event page, group page, LinkedIn groups, Quora Q&A and so on could be crucial to use for personal branding and achieving the beneficiaries. Determine your best places in the social media whereas you’ll have to put your core CTA buttons for the prospects. Suppose, you might have a fashion product and your online store is located on your blog, Facebook, and Pinterest. Then you’ll need to be emphasized on Pinterest marketing, Facebook marketing and obviously including YouTube and other major social channels as well. In terms of successful sales course, your personal brand to be imaged in the spirit of that course. Personal branding gets a live presentation by dint of proper networking. It is first and foremost to finding your allies and expanding network connecting all individuals and influencers in the same field. Take part in the local professional events to meet the influencers. Engage in community discussion, forum discussion and so far messengers conversations in the major social media and forums. Get leverage from the influencers in the social media to get the help of shares in the social media. Profound networking could work like a powerful key to success in the personal branding and sales. Your every conversion will be happening while your influence level has reached that horizon of power. Until you reach there, you’ll have to continue striving. Your influence means recommendation power which could able to happen ultimate sales of your product in the channels and funnels. Audiences look for their interest in rich value in the events, case studies and each of the blog posts. Does your content delivery go accordingly? Your content aim is to grab the audience attention and touch the engaging intention. For this purpose, you might embed your different stories in the content such as infographics, video, and podcast. You need to create a content cream that carries the diversified taste of value – but focusing the single target passively. In each content delivery, you’ll have to pay your attention to establishing a unique image through your presentational style and info truth. When you strive to present the information like a story could provide an extra inference to the audience regarding your notable personality as well. Video and podcast are powerful content to focus the ability. Various social ads, especially FB adverts could reach your personal branding at a new height. Group Marketing Campaign or community approach: Using FB, G+, LinkedIn and so on. Your constantly responsive presence will keep you up focused and branding. Share is care. If you do share the stuff of your quality followers and influencers, they will do the same. Sharing your follower’s post, you could easily fasten them in your active list of followers instead of the dead directory. You might follow 20/80 rules – sharing 20% of owners and 80% of your followers’ post to make an interactive followers community. Think you are a great storyteller and content curator. Think you’re a maven in your own fields like Rand Fishkin or Gary Vaynerchuk. You’ll have to establish your thought – you are really a maven. Take your own challenge and make you each journey of content campaign successfully. While it comes to failure never worried – find out the issues and resolve. You might once soon discover you an excellent brand ambassador for your own product. Viral Marketing action and so on. You’ll have to be highly responsive and real-time in each reply to the audience. Your constant engagement with quality presence, each conversation with happy closing and innovative re-approaches could help you form a state of the art personal branding and sales as well. Bringing the focus of the story towards the sales in each offer is to be influential. You’re making each offer to be beneficial, useful, transparent and solid. Your sales will happen due to the power of the story how you tell to the prospect they influenced. Your personal style of the influence is your branding. This is how the personal branding works for. Develop your personal branding through continuous monitoring. Think, you’re an all-time learner with innovation in the journey. Scan out the whole system of personal branding and diagnose the issues for next treatment. The journey is to resolve the issues for a stronger reputation. The effort is to build influence and driving its forces on conversions for increased sales. Your sales target is a big auxiliary mindset to build personal branding sooner than instead. Without recognizable personal product, it is an aimless journey to reach the branding goal. That is why you, your product and your branding productivity are composed of the same thread to develop your quick branding. Whatever you’ll imagine according to your deepest potential in personal branding, you will be like that. In the middle of between imagination and a real image is the answer to how to build personal branding – which refers you to create the solid change. Your mission with hi-tech knowledge, creative values, and vision will help you get the change ASAP. Your loyal voice of content marketing will reach you at the real image personal branding. You’ll have to play your long game in the spirit of your goal. What’s your personal branding new things that I missed here? Please feel free to share.